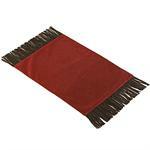 Bella Vista coordinating Damask Chenille set of 4 placemats. Each one measures 16"x20". Bordered in stylish faux leather and fringe, this faux tooled leather placemat provides a truly western focal point for any dining room. 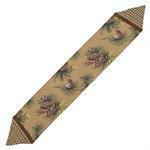 Set of 4 placemats. Each placemat measures 14"x20". 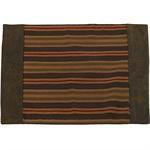 Del Rio Western Style Dining Table Placemats. Fabric. Set of 4 Geometic Chenille Placemats backed in Micro-Suede. Measures: 14x20. 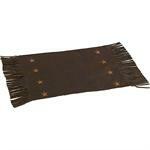 Del Rio Western Dining Table Runner. 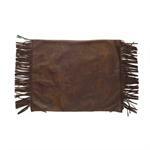 Chenille, Micro-Suede, and Faux Tooled Leather Fabric. 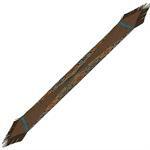 Measures: 16x72. 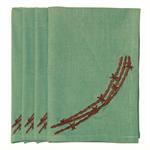 The San Angelo collection coordinating western decoration table linens. 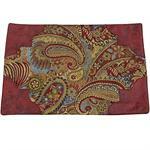 Paisley placemat with western style faux red leather corner details. Placemats (4). Measures 14"x20". 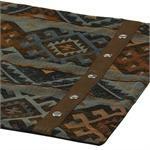 Wilderness Ridge Lodge Decor Table Linens Placemat Set Set of (4) Placemats featuring denim weight strip cotton with faux leather accents. 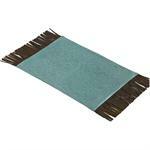 Placemats Measure 16x20.